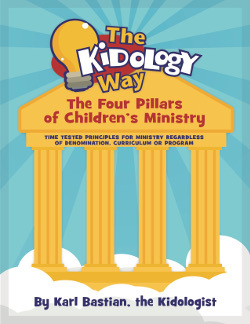 Inside The Kidology Way by Karl Bastian, you'll learn the Four Pillars of Children's Ministry that will ensure a ministry where kids become fully devoted disciples of Jesus. Trends come and go, but a ministry that is built upon this foundation will turn out solid kids who can stand strong through the storms of life. This 50-page eBook is available FREE to Kidology Premium Members. At its core are time-tested principles of children's ministry rooted in Scripture, which match up with the weekly realities of children's ministry as experienced by those in the trenches week in and week out. The Kidology Way doesn't offer shortcuts, easy solutions, or prepackaged ministry. However, as its Mission declares, it does seek "To Equip and Encourage Those in Children's Ministry," while upholding some principles that are the underpinnings of a solid, biblical children's ministry.